This list doesn't differentiate between DT positions. 1. Rashan Gary, Paramus, NJ ([link=http://www.hudl.com/athlete/1831776/highlights/203118382/v2]http://www.hudl.com/athlete/1831776/highlights/203118382/v2[/link]) Considered by some the #1 overall prospect in the country, Gary is an elite athlete that will contribute from day 1. Gary has a unique skill set and ability to covert speed to power that is seldom seen in a high school prospect that is not yet fully developed. Violent hands and elite pass rushing ability combined on a 6'4 280lb frame separate Gary from other linemen in his class. Gary mostly played on the edge in high school but projects to play inside at the college level, but he's also athletic enough to play DE in a 3-4 scheme. 2. Chris Daniels, Euless Texas ([link=http://www.hudl.com/athlete/2065514/highlights/225103377/v2]http://www.hudl.com/athlete/2065514/highlights/225103377/v2 [/link]) A Michigan native, Daniels is a load for opposing linemen to handle because of his size, power, and explosiveness off the snap. Well coached as one would expect from a prospects that hails from a strong high school program in Texas. Already adept at dealing with double teams, Daniels uses his hands and quickness off the snap to stun opposing linemen and make plays in the backfield. Daniels is a better run defender than pass rusher, but has the skill set to do both and should develop into a complete player down the line. 3. 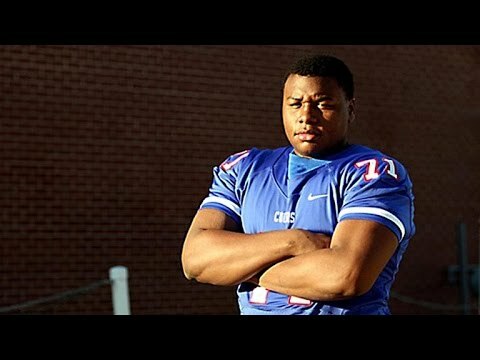 Dexter Lawrence, Wake Forest NC ([link=https://www.youtube.com/watch?v=PbKc1H-gLjI]https://www.youtube.com/watch?v=PbKc1H-gLjI[/link]) A mountain of a prospect at 6'5 310lbs, Lawrence represents the most powerful DT on Michigan's board. Plays high which will get him into trouble at the college level, but able to get away with it because he simply bigger, stronger, and more athletic than high school linemen. Lawrence is a pure power player that has an elite ability to move the line of scrimmage and create space. A natural center of a defensive line, Lawrence wrecks opposing game plans by penetrating vertically. Lawrence is also an underrated athlete that shows a good motor and ability to pursue the QB and chase ball carriers side to side. 3. Dexter Lawrence, Wake Forest NC ([link= ) A mountain of a prospect at 6'5 310lbs, Lawrence represents the most powerful DT on Michigan's board. Plays high which will get him into trouble at the college level, but able to get away with it because he simply bigger, stronger, and more athletic than high school linemen. Lawrence is a pure power player that has an elite ability to move the line of scrimmage and create space. A natural center of a defensive line, Lawrence wrecks opposing game plans by penetrating vertically. Lawrence is also an underrated athlete that shows a good motor and ability to pursue the QB and chase ball carriers side to side. I worry that we are putting A LOT of eggs in one basket here. Hopefully the coaches have developed a good backup plan or go with the Urban Meyer strategy (my personal favorite) and get 1 DT and 4 DEs, and whichever DE puts on the most weight becomes the 3tech or quick DT. That's exactly what they do, and not just on the DL. They get the best athletes and find positions for them when they get on campus. Darron Lee and Jalin Marshall were both HS QB's for example.